When I was a little girl I found a yellow teddy bear and saved his live. Later he inspired me to create my own teddy bears, rabbits and other lovely animals in vintage style. In 1992 I started with the label Anna Dazumal®, this name describes the romantic character of the good old days I appreciate. 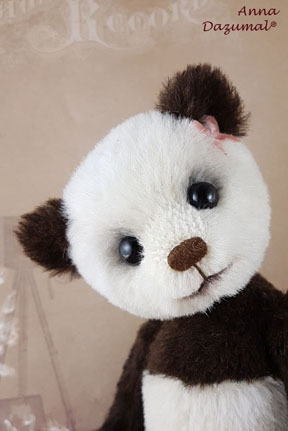 It´s fascinating to get a lovely fellow by taking a piece of mohair, glass eyes and some more high quality materials. They all are 5 way jointed like the traditional way of bearmaking. 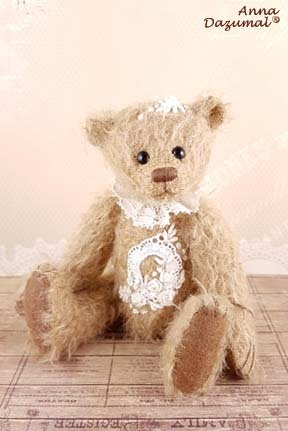 Most of my bears have lovely clothes or details, made of antique lace and fabrics. 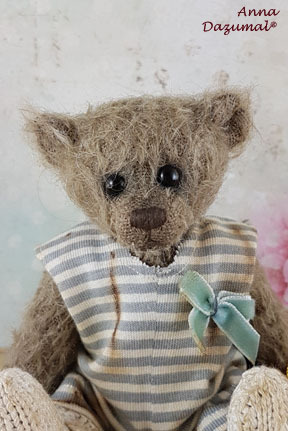 I love to create miniature bears as well as big bears to hug. 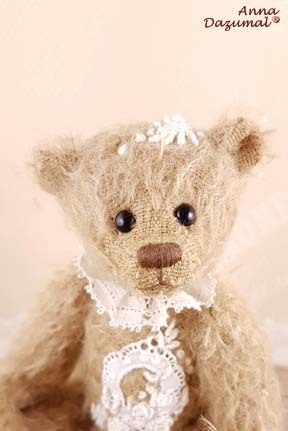 My specialities are handmade accessories and bears with gorgeous embroideries. Some of my creations have been successful in international competitions like Toby, the Golden George, Ted Worldwide and TiTa Award. A few of my drafts were produced at Hermann/Hirschaid, Clemens and Steiff. All items are for collectors only and not suitable for children. If you like to adopt one of these bears, please send me an e-mail with the name of your favorite. Then you will get information about the price, shipping and terms of payment. PayPal is the safest, easiest way to pay and you do NOT need a PayPal account for it! Items will be shipped worldwide only by DHL (insured). I am not responsible for any custom fees. Innerhalb Deutschlands erfolgt der Versand nur per DHL als versichertes Paket. In case you are not satisfied with your adoption, please email me. You can ship it back to me within 7 days after you have received the item. Put it in it´s original condition and insure the parcel in its full value. You´ll get the full refund less shipping and insurance costs when it´s back to me. 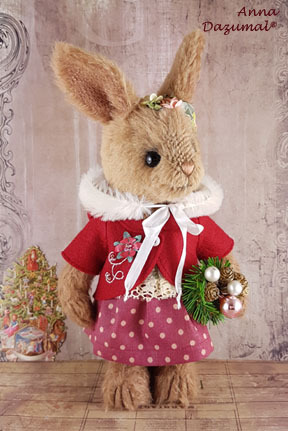 Bonnie is such a nice RabbitGirl, made of Alpaca in brown. Hands and feet are made in a suitable colored felt. Filled with fiberfill and mineral pellets for a better weight. She has black German glass eyes and a stitched nose. Her arms are wired for a better posing. Bonnie can stand alone and sit. Bonnie´s head is sculpted and shaved, her face is a little bit shaded. 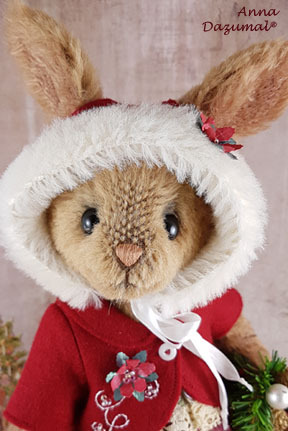 She wears a nice red jacket and a bonnet hat, with xmas flower decoration and embroidered curls with antique glass beads. 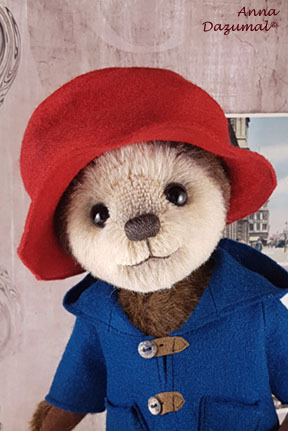 Her red felt jacket and the bonnet are removeable. Below she wears a nice dress and flowers around her nice ears. So she´s a pretty rabbit girl for spring and summer. Bonnie ist aus schönem braunem Alpaka. Hände und Füße sind aus farblich passendem Filz. Füllung: Füllwatte und Mineralgranulat. Sie ist 5 -fach gescheibt und ihre Arme sind mit Drahteinlagen, um sie noch schöner positionieren zu können. Sie kann allein Stehen. Sie hat schwarze Glasaugen und eine gestickte Nase. Bonnie´s Gesicht ist sculptiert und schattiert. Ihre rote Jacke und die Haube kann sie ausziehen, darunter trägt sie ein somerliches Jäckchen und Blumen im Haar. Lea is such a cutie! 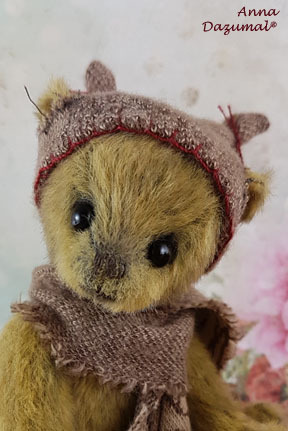 This TeddyBearGirl is made of short felted antique styled mohair in brass color. Hand and feet are made of felt in dark brown. Filled with fiberfill and steel pellets for a better weight. She has black German glass eyes and a stitched nose. She comes with her birth certificate, including name and date of birth. Sweet Lea is a little bit shaded. Her amazing jacket is handknitted. She brings her little Christmas tree in her new home. Lea ist ein süßes Bärenmädchen aus messingfarbenem Antikmohair. Hände und Füße sind aus braunem Filz. Füllung: Füllwatte und Stahlgranulat. Lea ist leicht schattiert, die Jacke handgestrickt. Sie bringt ihr kleines Tannenbäumchen mit ins neue Zuhause. 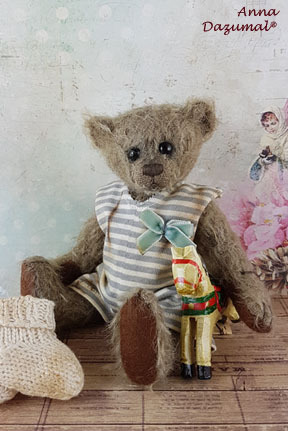 Eddie is a charming Teddy BearBoy, made of short antique felted mohair in grey brown. Hand and f eet are made of brown colored felt. Filled with fiberfill and steel pellets for a better weight. H e has black German glass eyes and a stitched nose. He comes with his birth certificate, including name and date of birth. Eddies ´s face is soft shaded. He wears a nice bodysuit with white and blue stripes. It was a little bit cold, so he loved to have his knitted socks (removeable). He comes with his little christmas ornament, an antique looking horse. Eddie ist ein hübscher Bärenjunge aus graubraunem Antikmohair. Hände und Füße sind aus braunem Filz. Füllung: Füllwatte und Stahlgranulat. Er hat schwarze Glasaugen und eine gestickte Nase. Eddies´s Gesicht ist leicht schattiert, Er hat sich für einen schicken Body entschieden und da es ihm zu kalt war, hat er ein paar wrame Socken bekommen. Er bringt auch sein pferdchen mit ins neue Zuhause. 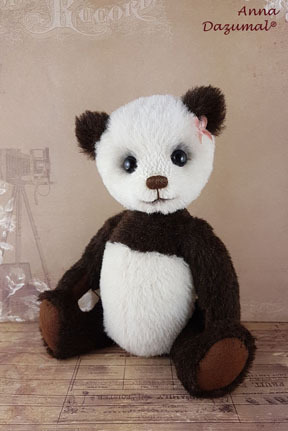 PandaGirl Lucy is an amazing TeddyBear, made of Alpaca in brown and white. Hands and feet are made in a dark brown felt. Filled with fiberfill and mineral pellets for a better weight. She has black German glass eyes and a stitched nose. Her arms are wired for a better posing. Lucy´s face is a little bit shaded. Her head is sculpted and shaved to get a real cute face. Lucy ist ein bärzauberndes Pandamädchen Alpaka in weiß und dunkelbraun. Hände und Füße sind aus braunem Filz. Füllung: Füllwatte und Mineralgranulat. Sie ist 5 -fach gescheibt und ihre Arme sind mit Drahteinlagen, um sie noch schöner positionieren zu können. Sie hat schwarze Glasaugen und eine gestickte Nase. Ihre Arme sind mit Drahteinlagen, sodaß sie auch mal etwas umaarmen kann. Lucy´s Gesicht ist leicht schattiert und sculptiert. 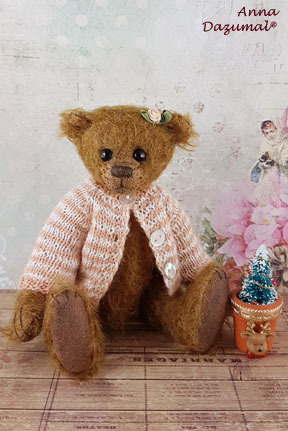 TeddyBoy Paddy is an real cute TeddyBear, made of Alpaca in brown and light brown. Hands and feet are made in a suitable colored felt. Filled with fiberfill and steel pellets for a better weight. He´s 5 way jointed and his arms are wired for a better posing. He has black German glass eyes and a stitched nose. Paddy´s face is a little bit shaded. His head is sculpted and shaved, to get a real cute face. 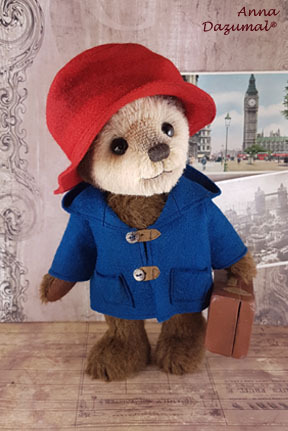 He comes with his hat, coat and suitcase, all made by me . He can stand alone or even sit. Paddy ist ein richtig süßer BärenJunge aus Alpaka in hell und mittelbraun. Hände und Füße sind aus braunem Filz. Füllung: Füllwatte und Stahlgranulat. Er ist 5 -fach gescheibt und seine Arme sind mit Drahteinlagen, um ihn noch schöner positionieren zu können. This is Mike, a HedgehogBoy. 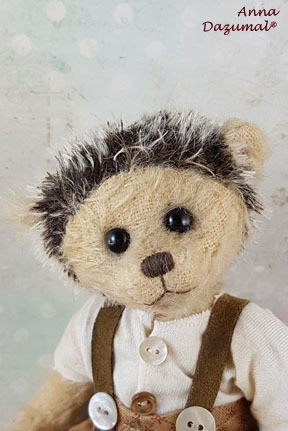 He is made of antique style mohair in beige and a hedgehog mohair in brown with white tips. Feet are made of suitable colored felt. Filled with steel pellets for a better weight. He has black german glass eyes and a stitched nose. Mike is soft shaded and wears a shirt and a trouser. 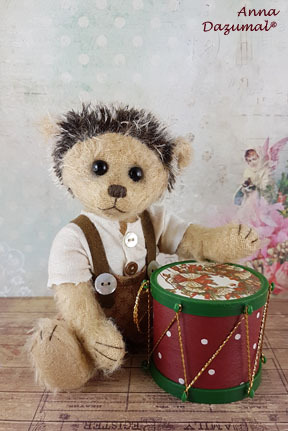 He`s a curious Hedgehog boy and comes with his Xmas drums. Mike, der niedliche Igeljunge ausbeigem Antikmohair und Igelmohair.Seine Füße sind aus hellem Filz. Füllung: Füllwatte und Stahlgranulat. Mike´s Gesicht ist leicht schattiert. Da er sehr lebhaft ist, hat er beschlossen, Trommel zu spielen. Dieses weihnachtliche Exemplar bringt er natürlich mit. 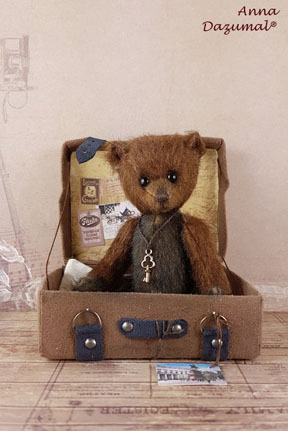 Theo, a halfhandful Teddy, is made of longpile in a very nice antique brass color. Filled with fiberfill and steel pellets for a better weight. He has black German glass eyes and a stitched nose. Theo is shaded. He wears a scarf and a hat, both are removeable. 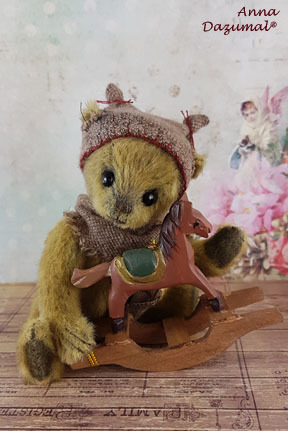 He brings his little rocking horse in his new home. Theo, eine halbe hand voll Teddy, aus wunderschönem Long Pile in einem messing Farbton gefertigt. Füllung: Füllwatte und Stahlgranulat. Theo kann sein Mützchen und den Schal auch ablegen. Er hat sein Pferdchen mit dabei. 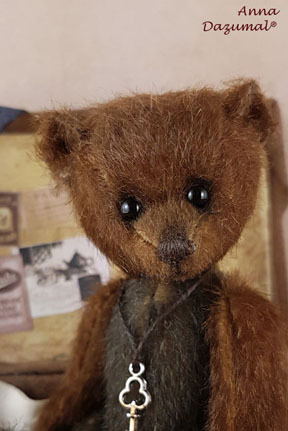 Linus, a halfhandful Teddy, is made of very short longpile in a very rare colormix: brass and dark green. Filled with fiberfill and steel pellets for a better weight. He has black German glass eyes and a stitched nose.Linus is a little bit shaded. He wears a little key to his heart and maybe for his new home. He comes with this amazing suitcase. I made it for this real tiny bear. Linus, eine halbe handvoll Teddy, aus wunderschönem Long Pile Farbmix in messing und dunkelgrün gefertigt. Füllung: Füllwatte und Stahlgranulat. Wenn man möchte, bringt er sein kleines handgefertigtes Köfferchen mit ins neue Zuhause. Rabbitgirl Peach is made of long pile in a wonderful colormix: cream and peach. She has black German glass eyes and a stitched nose. Filling: Fiber fill and mineral pellets for a better weight. She wears a collar with white pompoms. 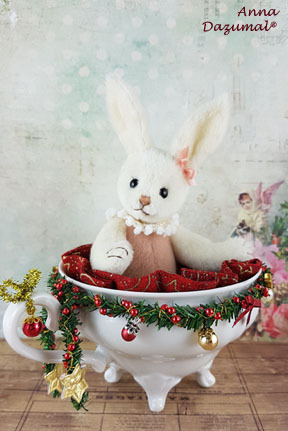 She comes with the little antique cup, decorated with christmas garlands. Hasenmädchen Peach ist aus Long Pile in 2 wundervollen Farben: creme und apricot. Sie trägt einen cremefarbenen Kragen und bringt die weihnachtlich verzierte Wohntasse mit. 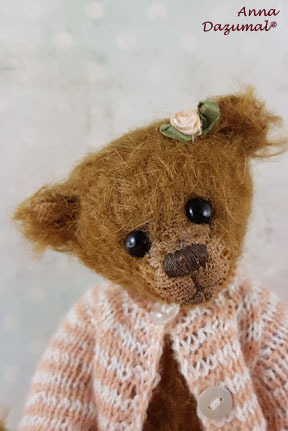 Floria is an amazing TeddyBearGirl, made of antique style mohair in a light brown color. Hands and feet are made in a suitable colored felt. Filled with mineral pellets for a better weight. She has black German glass eyes and a stitched nose. The cream colored roses at her body I embroidered by hand. They are combined with an antique embroidered frame. Around her neck is a collar made of antique lace. 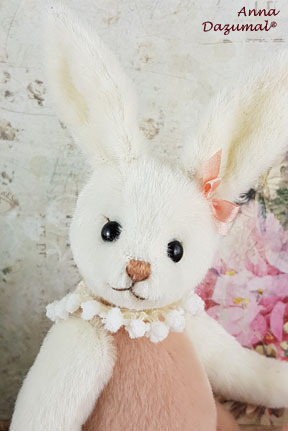 Floria ist ein bezauberndes Teddybärmädchen aus hellbraunem Antikmohair. Hände und Füße sind aus farblich passendem Filz. Füllung: Füllwatte und Stahlgranulat. Die cremefarbenen Rosen auf Ihrem Körper sind mit Hand aufgestickt und mit einem antiken Spitzenrahmen kombiniert. Sie trägt einen Kragen aus antiker Spitze.